This is our Happy Cats Guide eBook chapter 5 of 12. Click here to see all chapters. During the course of an entire day, a cat may spend 14 – 16 hours sleeping. Sleep is thus a very sacred and important ritual for our feline friends. But why do cats like to sleep so much? We do not have definitive answers, but it is likely due to their diet and activity in the wild. As mentioned earlier, cats are crepuscular animals. This means they are most active during dawn and dusk – a time when birds and most of their natural prey are also most alert and about. You may have also noticed that cats are prone to sleeping whenever they want during the day, followed shortly thereafter by a bout of tearing around the house and running madly — typically early in the morning when you are trying to sleep! Despite seemingly ignoring the world, cats remain relatively alert as they sleep. You may even see their ears move towards certain sounds as they snooze. 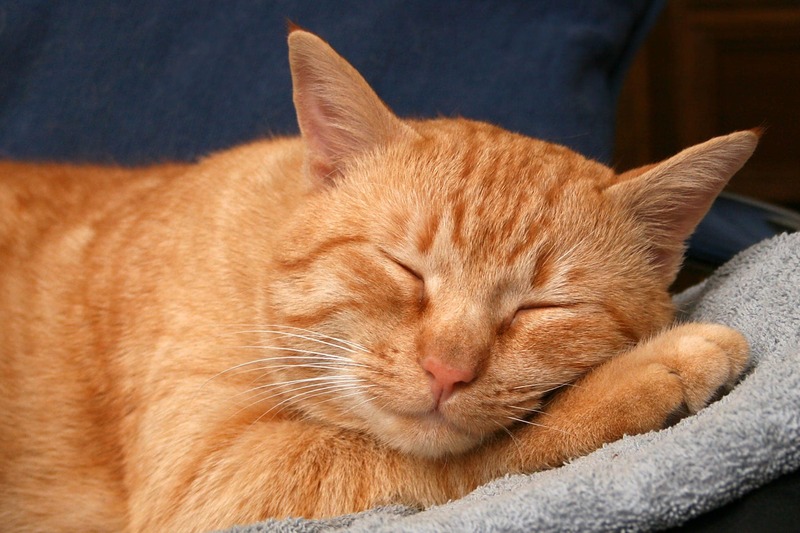 This “sleeping alertness” is another reason why cats typically have 14 – 16 hours worth of short periods of sleep, rather than several longer uninterrupted sleeps. The sleeping alertness is thought to be a natural behavior, one that helps cats stay adequately alert to be aware of any nearby predators, despite snoozing contentedly. Cats will sleep wherever they can make themselves comfortable, but will typically prefer an area that is warm, relaxing, raised up off the ground, and an enclosed space. It is therefore recommended that your cats have a number of sleeping areas and/or cat beds available, preferably in more than one room of your house. The reason? 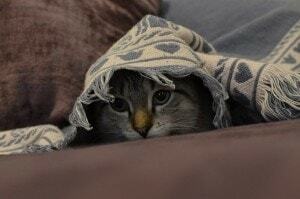 Each cat in your home needs to have a safe place they can retreat to if they are stressed or nervous. To hone in on where those safe places might be, think about to a time when they were stressed or scared. Where did they run to in your house? Did they hide anywhere specifically, more than once in a row? 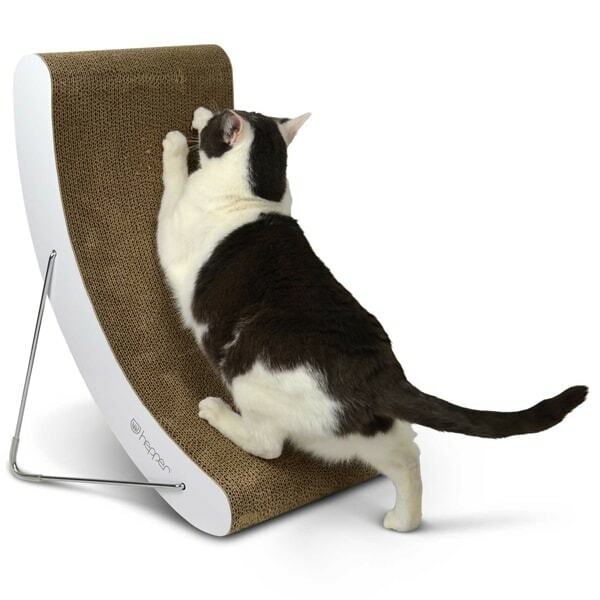 Ideally each cat in your home would have a room where they can each retreat, to avoid one another if necessary. Understandably not all homes will have room for numerous save havens! However, to the extent possible having multiple comfortable and protected sleeping areas, one for each cat in your home, will have an almost immediate effect in reducing stress and increasing your cat’s happiness levels. There are many regular pet beds available on the market ranging from soft padded cushions, to hammocks, to paw-print covered pillows. The Hepper Pod bed was designed to feature the qualities that your cat needs to feel both safe and comfortable to sleep around your home. Ideally, having multiple Pods per cat in separate areas of your home means that the natural sleep rotation that occurs with cats can take place with ease. 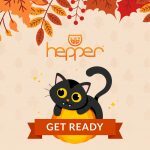 Cats will sleep wherever they like, however they do tend to favor warm, quiet and comfortable places – another reason that the Hepper Pod bed, with its fleece liner, is always so popular. 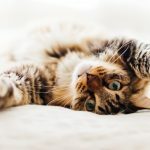 As we discussed above, having several spots around your home where your cat can snuggle up and rest peacefully is all part of creating their ideal indoor space. Having a couple of Hepper Pod beds per cat is a great start, and ideally these would be in two very different rooms. But where to put the beds? On the floor, if there is a sun spot that your cat finds its way to each day. In addition, cat beds can be placed upon cat furniture or cat trees, and atop higher furniture like wardrobes to give your cat a comfortable but secure vantage point over its sleeping abode. 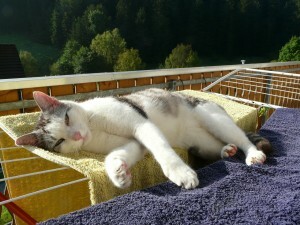 If the location is relaxing, warm and quiet, your cat will probably sleep there. Because cats tend to sleep for short periods of the day, broken up by periods of grooming, playing and eating, they also tend to move from bed to bed. This is why having multiple sleep areas available for each cat in your home is best for making your cats happy. 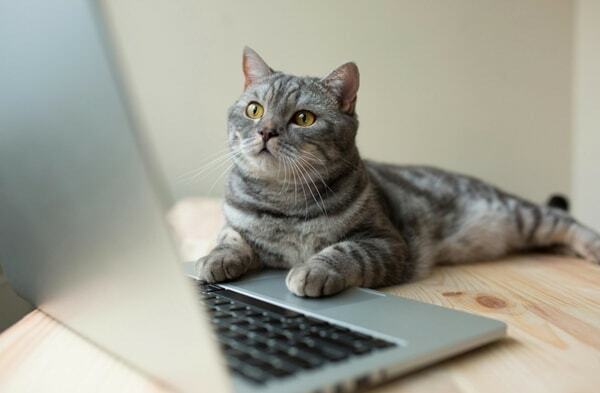 After having observed each of your cats in your home, you probably already have a rough idea of where they run to if they are stressed out or nervous. This location is possibly the place they also spend most of their time sleeping. 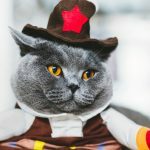 Locating and enhancing your cat’s safe space is one of the most important parts of creating the ideal cat-friendly home. If you aren’t sure where your cat’s safe place is, spend a few days observing him or her and make a note of where most of their time is spent. Where do they go when someone comes to the door? Where to they spend most of their time sleeping? With some time and observation, it won’t take long to work this out. If you don’t think your cat has a safe place, then you need to take a careful look at the map of your home you made earlier. On that map, where is the quietest and warmest spot? If you have more than one cat, then each cat may need his or her own room with a safe place in it. 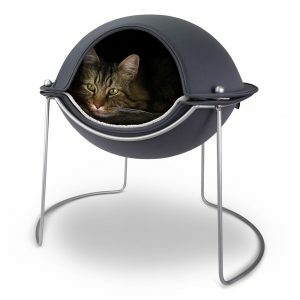 This might be a warm cat bed on top of a wardrobe for one cat, and a Hepper Pod bed in the study for the other cat. For cats within a household that get along to the point where they will snuggle and groom each other, having their safe places in the same room is fine, especially if you are in a smaller home. Cats are typically either ‘tree-dwellers’ or ‘bush-dwellers’ – sometimes they are both! A ‘tree-dwelling’ cat will prefer to get up high, and will feel safer at a height, whereas ‘bush-dwelling cats’ prefer to stay at ground level, but need to have a place to hide in and feel safe in. Decide if your cat is one, the other, or both, and take this into consideration when choosing and creating their safe place. 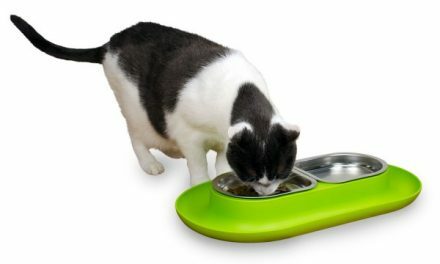 Giving each cat in your home their own safe space will decrease tensions between your cat and any other cat or animal. 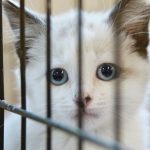 It will also help them to de-stress in their own time, and ultimately lead to less behavioral issues — meaning happier cats, and happier owners! This is chapter 5 of the 12 chapter series.